Ghost in the Shell is the the most visually bold film of the year thus far; Color and light burst off the screen throughout. Though director Rupert Sanders has taken many shots and ideas wholesale from the comic and movie upon which this movie is based, he wasn’t afraid to make his own choices and images. Major’s birth, for instance, shown rather clinically in the original animated film, is here bathed in sensual lights while the score pulses underneath. It really feels like the creation of life and she washes through red-tinged fluid and her new cybernetic enhancements coil through power couplings and slide into her brain. There is another sequence which shows the hacking of a damaged robot which is legitimately amazing. The technology available to digital artists has allowed the team behind GitS to create awesome digital paintings that rival the exceptional artistry of the original film. Stunning visuals aren’t the only thing this Ghost has in common with the ’95 adaptation (also just Ghost in the Shell, so forgive me if it becomes perplexing as to which I’m talking about). It feels as dramatically rote and thematically inert as the ’95 movie plays now. The animated classic was the Blade Runner of its day: a film heralded for its visuals, incredible sense of world building and production design while not having as much going on under the hood as it may seem. Oh, sure, in both the ’95 movie and the ’17 version there is the whole question of “What makes us human” and the desire for individuality and a sense of self in an increasingly connected world, but any sense of drama from those ideas is felt through a daze of placid disinterest. It often feels like a balancing act of pushing the story along so that the next bold visual statement can be made. While the world of ’95’s GitS seemed relatively normal compared to its hidden cybernetic core, there’s no such pretense in the modern iteration. Cybernetics and robotics are on full display. The world is a cacophonous attack of information, evoking shades of Darrick Robertson and Warren Ellis’ Transmetropolitan and it’s post-information society. People live constantly on the grid and connected to the network, surrounded by robotic and enhanced people from the butchers all the way to the prostitutes. It’s a fascinating world to watch on screen. The movie follows Major Mira Killian (Scarlett Johansson) and other members of Japan’s Section 9 police division. Essentially the special forces of the police, the team takes on problems that the conventional forces can’t handle. Their current target is a violent and mysterious hacker named Kuze (given little to no life by Michael “Carmen” Pitt), who is killing off members of the Hanka Corporation. This is the same corporation that constructed Major’s body, sees to the enhancements of the entire Section 9 team, and appears to order the unit around as if they belonged to them. The idea of little to no barrier between corporate and government control is never significantly commented on in the movie, though it appears as a loose plot point. One character, the director of Section 9 (played by stone-cold badass “Beat” Takeshi Kitano) points out to the President of Hanka that Section 9 doesn’t work for them. The President laughs off his assertion. The plot unfolds as Major continues to track down Kuze at risk to her mind (her body is replaceable) and ends up discovering more about her past. 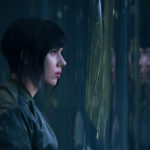 Much could be made of the choice to use Scarlett Johansson in the role of Major Motoko Kusanagi (the original characters name) over a Japanese actress. They could describe the change as the ultimate form of skin lightening, a practice in Japanese culture, which, though developed separately to the European court practice of using powders to cover blemishes, had the same intended desire. It could even look at the change in race as a means of exploring the fetishization of the white female body in cinema. However, the film isn’t interested in exploring or addressing it at all. This Ghost in the Shell world seems to exist in a post-racial society. Section 9 itself is made up of a multinational group of people (though they all retain their original Japanese names from the manga). When anyone can plant their brain into the body of whatever race, gender, or body type that could be imagined, perception of the outside self seems almost pointless. The film tells us that Major was a Japanese teen runaway, who was kidnapped and had memories implanted when she was put into the body of a White Super Lady. Early on in the film, this Japanese teen trapped in a white woman’s body quite literally shoots a Cyber-Geisha in the face. So I guess you could say they do address it, though maybe not with the semiotic value that they intended. You might dig in to the scene and see it as the Major’s implants and training kicking in to force her to violently reject a representation of her own inner self, a Japanese woman wearing white makeup. But there I might be doing a little too much work for this movie. Probably more than it wants me to. Sometimes this movie feels like your friend, who, when high or just feeling particularly introspective, will express some grand philosophical notion that peters out before it gets anywhere. Or maybe it starts down the path to being profound, but never quite gets there. What does it mean to be human? Ghost in the Shell purports that it is our present choices that define us, not our past. But then…the only way that Major learns how to feel human again is by rediscovering her past. This dissonance should tell you a lot about the half-baked script, which features moments of ScarJo speaking without contractions (“She’s mostly a robot, remember? ?” the script grins) but then playfully flipping off Batou in the next scene (Pilou Asbæk as Batou, by the way, is a real treat and highlight of the movie). This movie is a sumptuous feast of visuals. It makes big and bold choices that you wish more contemporary blockbusters would feel comfortable making (between this, Kong, and Get Out we’re already off to a good start this year). It will also leave you feeling supremely flat and underwhelmed by the narrative lying within. I would go as far as to say the film would play better just with Clint Mansell and Lorne Balfe’s score underneath, and the dialog removed. It would be a more than dazzling cinematic experience if it could just transcend its rote story and questionable racial politics.